The Raven wooden greenhouse from Swallow GB, available in a width of 8'9 (2.66m) and a selection of lengths from 6'4 (1.92m) up to 20'10 (6.36m). Featuring inward opening double doors for wide access, these are perfect for those wishing to move a wheelbarrow in and out of the greenhouse. This model also benefits from a generous ridge height for a spacious growing interior. New for 2011, the Raven can be painted for an additional charge, choose between Somerset green, Willow, Sea grass, Black Ash, Maple leaf and Seasoned Oak from the Cuprinol Shades range. Please contact us for further details and pricing. 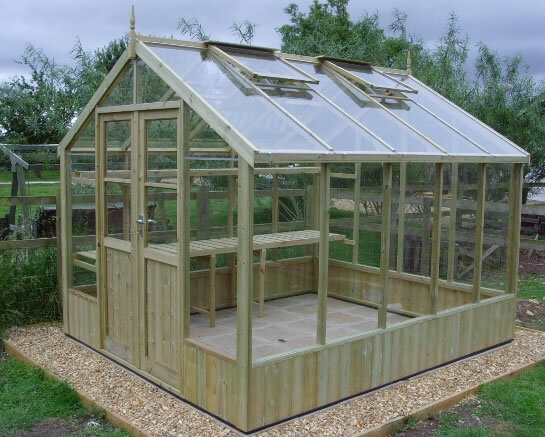 The Raven Greenhouse 10'5 x 8'9 (3.18m x 2.66m), a double door model with spacious interior. Includes staging and four roof vents. The Raven Greenhouse 16'9 x 8'9 (5.10m x 2.66m), a double door model with spacious interior. Includes staging and four roof vents. The Raven Greenhouse 18'10 x 8'9 (3.18m x 2.66m), a double door model with spacious interior. a selection of paints is available to customise your shed. The Raven Greenhouse 20'10 x 8'9 (6.36m x 2.66m), a double door model with spacious interior. A variety of lengths are available on these buildings. Pressure treated Raven Wooden Greenhouse 6'4 x 8'9 (1.92m x 2.66m). With two roof vents, automatic vent openers and staging. Includes Free Installation! Spacious Raven Wooden Greenhouse 8'4 x 8'9 (2.55m x 2.66m). Featuring double doors and a generous ridge height. Includes Free Installation! The Raven Greenhouse 8'9 x 12'7 (266cm x 384cm), a double door model with spacious interior. Includes staging and four roof vents. The Raven Greenhouse 8'9 x 14'8 (266cm x 447cm), a double door model with spacious interior. Includes staging and four roof vents.